Bourne caught five of six targets for 59 yards and touchdown in Sunday's 48-32 loss to the Rams. Bourne may be the 49ers' de facto No. 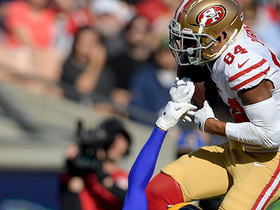 1 wide receiver Sunday against the Rams with Marquise Goodwin (calf) and Dante Pettis (knee) sidelined, Matt Maiocco of NBC Sports Bay Area reports. Analysis: Bourne has handled at least 74 percent of the offensive snaps in six of the last eight games, a span in which he compiled 27 catches (on 41 targets) for 308 yards and one touchdown. With Goodwin and Pettis out of the picture, Bourne's primary competition for the attention of Nick Mullens will be tight end George Kittle. Also helping Bourne's cause is a Rams defense that has given up 9.1 YPT and 18 TDs to wideouts this season. Bourne had four catches (five targets) for 73 yards in Sunday's 14-9 loss to Chicago. Analysis: Starting wideout Dante Pettis (knee) left the game in the first half, opening the door for Bourne to post his highest yardage total this season. Pettis is already expected to miss Week 17's matchup with the Rams, and if Marquise Goodwin (Achilles) also misses the contest, then Bourne would rocket up to first on the receiving depth chart and receive a healthy boost in fantasy value. Bourne caught two passes (four targets) for 16 yards in Sunday's 26-23 win over Seattle. 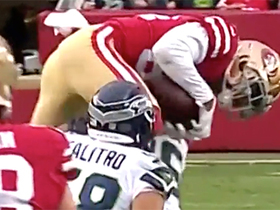 Analysis: Bourne finished second in wide receiver targets behind Dante Pettis for the second straight game, even with Marquise Goodwin (calf) suiting up. 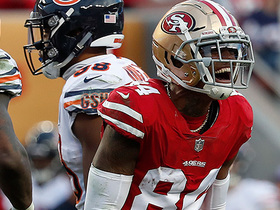 The 49ers clearly want to give their young receivers an opportunity in a lost season, but the 23-year-old's production is too sporadic to be trusted in standard leagues, especially with Chicago's dominant pass defense coming to town Sunday. Bourne caught two passes (four targets) for 22 yards in Sunday's 20-14 win over the Broncos. Bourne is expected to retain a regular role in three-receiver formations Sunday against the Broncos with Pierre Garcon (knee) ruled out for the contest, Nick Wagoner of ESPN.com reports. Bourne caught four of six targets for 60 yards in Sunday's 43-16 loss to the Seahawks. Bourne and Austin Pettis will serve as the 49ers' starting receivers in Sunday's game in Seattle, Matt Maiocco of NBC Sports Bay Area reports. Bourne caught two of three targets for 27 yards in Sunday's 27-9 loss to the Buccaneers. Bourne is expected to start in place of Pierre Garcon (knee) on Sunday against the Buccaneers, Cam Inman of The San Jose Mercury News reports. Analysis: Otherwise limited to a minor role, Bourne has 11 catches for 104 yards on 16 targets in the two games Garcon has missed this season. A matchup with Tampa Bay does create some upside, but Bourne will have a hard time matching the aforementioned volume in an offense that also wants to find targets for George Kittle, Marquise Goodwin, Matt Breida and Dante Pettis. Bourne (undisclosed) isn't listed on the 49ers' injury report, Jenna Laine of ESPN.com reports. Bourne (undisclosed) appeared to be a limited participant in Monday's practice, Cam Inman of The San Jose Mercury News reports. Analysis: There hasn't been anything to suggest Bourne's availability for Week 12 is in danger, but his status is nonetheless worth monitoring as the week unfolds. With Pierre Garcon (knee) uncertain to play, Bourne could be in store for a sizable workload this weekend against a Buccaneers defense that is allowing a league-high 32.9 points per game in 2018. 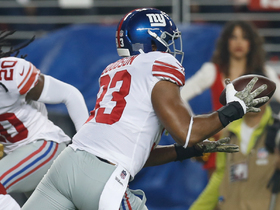 Bourne caught four passes (seven targets) for 33 yards in Monday's 27-23 loss to the Giants. Analysis: Bourne entered the starting lineup in place of Pierre Garcon (knee), finishing second in targets for the 49ers. The high usage didn't result in a useful fantasy line, highlighting the 23-year-old's low upside in standard leagues. With San Francisco's bye week on tap, Bourne could find himself in a backup role if Garcon can heal up with the extra rest. Bourne caught both of his targets for six yards and a touchdown in Thursday's 34-3 win over the Raiders. Bourne caught seven of 10 targets for 71 yards in Sunday's 18-15 loss to the Cardinals. Bourne was not targeted in Sunday's 39-10 loss to the Rams. Analysis: Trent Taylor (back) was able to return to action, pushing Bourne back to fourth on the receiver depth chart. The Rams' dominance in the trenches resulted in C.J. Beathard targeting wide receivers just nine times, none of which went Bourne's way. The 23-year-old's value is severely limited now that the starting receiving corps in San Francisco is back at full strength. Bourne caught one pass (three targets) for 22 yards in Monday's 33-30 loss to the Packers. Analysis: Bourne was elevated to third on the receiving depth chart with both Trent Taylor (back) and Dante Pettis (knee) sitting out Monday's contest. 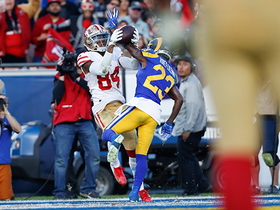 Despite the increased role, the 23-year-old saw fewer targets than either of his previous two games (four and seven, respectively) when he served as the 49ers' fourth receiver. Bourne does have two touchdowns on the year, but his sporadic target share keeps him off the fantasy radar for the time being. Bourne recorded four catches (on seven targets) for 33 yards in Sunday's loss to Arizona. Analysis: Bourne was elevated into the starting lineup with both Marquise Goodwin (hamstring) and Dante Pettis (knee) sitting this one out. The 23-year-old saw a career-high seven targets, but none of those came in the red zone -- he had two red-zone targets and two touchdowns over the previous three games -- resulting in a lackluster fantasy line. It is unclear if Goodwin and Pettis will be able to return next week against the Packers, so Bourne could be in line for another start. Bourne had three receptions (four targets) for 34 yards and a touchdown in Sunday's loss to San Diego. Bourne pulled in his lone target for a four-yard touchdown in Sunday's win over the Lions. Analysis: Bourne moved up to fourth on the wide receiver depth chart with Marquis Goodwin (quad) being held out. The 23-year-old took advantage of the opportunity, scoring the first touchdown of his NFL career on a swing route out of the backfield. Bourne would revert to a depth/special teams role if Goodwin is able to return next week against Kansas City. Bourne survived Saturday's roster cuts and will begin the season on the 49ers' 53-man roster. Analysis: Bourne made the cut over veteran Aldrick Robinson and fellow youngster Aaron Burbridge. The 2017 undrafted wideout was able to make his mark with 257 yards on 16 receptions over the final eight games of his rookie season. With the top of the 49ers' wide receiver depth chart set in stone, Bourne will serve a special teams/depth role to begin the year. Bourne was one of the 49ers' most consistent pass catchers throughout the offseason program, ESPN.com's Nick Wagoner reports. Bourne finished the year with 257 receiving yards on 16 receptions (34 targets). Bourne had four catches (six targets) for 85 yards in Sunday's 25-23 win over Tennessee. Bourne was on the field for 31 of 73 offensive snaps Sunday, finishing with two receptions for 29 yards in a win over Houston. Bourne hauled in all three of his targets for 42 yards in Sunday's 31-21 win over the Giants. Analysis: The undrafted rookie saw his first action as a receiver last week (two catches for 39 yards) and generated similar numbers for the second consecutive game. 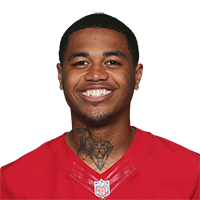 Bourne's uptick in production has coincided with a couple of injuries to San Francisco's receiving corps, but even if Trent Taylor (ribs) is able to return following the team's bye week, the 1-9 49ers may opt to keep the 22-year-old involved in the passing game to see what they have in the Eastern Washington product down the stretch. Bourne caught two passes (six targets) for 39 yards in Sunday's 20-10 loss to Arizona. San Francisco 49ers wide receiver Kendrick Bourne makes a tough grab for touchdown. San Francisco 49ers wide receiver Kendrick Bourne jumps over defenders for a 20-yard catch. 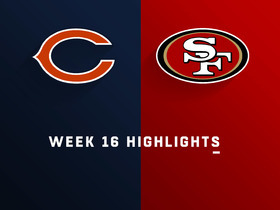 Watch complete highlights from the Week 16 matchup between the Chicago Bears and San Francisco 49ers. 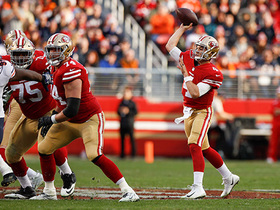 San Francisco 49ers head coach Nick Mullens comes up with a clutch pass to wide receiver Kendrick Bourne for 25 yards. San Francisco 49ers quarterback Nick Mullens rips it to wide receiver Kendrick Bourne over the middle for 22 yards. 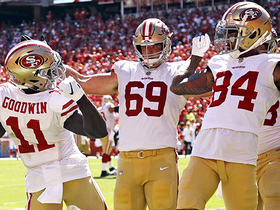 San Francisco 49ers quarterback Jimmy Garoppolo tosses an 11-yard touchdown pass to wide receiver Marquise Goodwin, and Goodwin celebrates with Kendrick Bourne after the play. San Francisco 49ers wide receiver Kendrick Bourne makes a big leaping catch for 12 yards against the Seattle Seahawks. San Francisco 49ers wide receiver Kendrick Bourne dashes for 33 yards on a catch and run vs. the Seattle Seahawks. New York Giants linebacker B.J. Goodson intercepts Nick Mullens' pass off a deflection.